We’re excited to launch a new Member Interface that’ll have you jumping up and down! Yesterday, our Developer Team launched a New BETA Member Interface, which you can personalize and make your own. We figured since you are the one using it, why not have the ability to make it look and work the way you want it. Right? Clicking that link launches your journey into personalizing your space. Keep in the mind that it’s in BETA right now, so you can revert back to the old look if you prefer. On the top of the page is the “take a tour” link. The tour will walk you through a few steps to explain the customization process. Once you log in, take the tour, move your widgets around and jot down notes to let us know why you love it or why it may be something you won’t use. So how does it work? Simply login and begin. Completely Customizable Homepage – You can change the theme, move your widgets around, and only display what is important to you. You can also change it at ANY time. Easy Access – You will have instant access to important tools and resources. 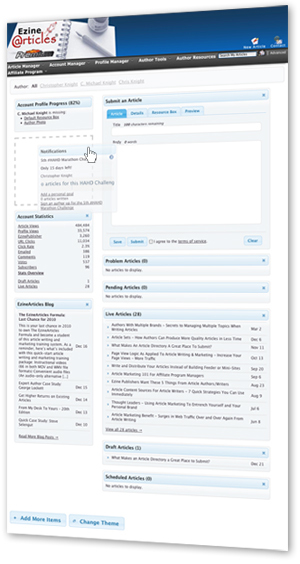 Display your stats, profile, live articles, pending articles, problem articles, your recent activity, message center, quick links, EzineArticles Blog, scheduled articles (Premium membership only) and more. Faster Load Times – Articles in each article status (pending, live, draft, etc.) appear faster than ever before. Authors that have many articles will notice a significant decrease in load times. The normal 30-45 second article load time is now instant! 6 Themes to Choose From – Change your background to fit your personality. Default Option – If you finish customizing and realize you don’t like it, click on the red “Reset Widgets” button in the “Add More Items” window to return your homepage back to the default widget style and layout. Submit an Article – You have the ability to submit an article right from the homepage. Like the old interface, you will be alerted if anything is missed in the process. So … what are you waiting for? Go play! And remember, this is in BETA testing right now, so you can switch back to the old homepage at any time. When you’re done, stop back and leave us a note. Tell us what you liked and what we can improve. Your suggestions pave your road to success.